This week’s Tech Tip is written by our guest blogger, Elizabeth Bowman, President of Innovatively Organized. Are tasks slipping through the cracks? Feeling overwhelmed by all the responsibilities on your plate? There are lots of tools to help you manage your to-do list, but how do you know which tools are best? You’re in luck! At Innovatively Organized we have put together a list of 4 tools to help you manage your to-do list electronically. Now, you will be able to access your tasks from home, the office, or on the go from an Internet browser or your mobile device! Keep in mind, it’s not about having the perfect to-do list, it is about picking a tool that will work for you and using it consistently. For more organizing and productivity tips, check out the Innovatively Organized blog! 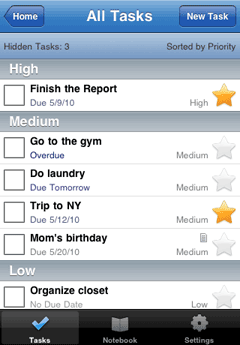 Read more about Innovatively Organized, iPad, iPhone, manage, productivity, to do.